Clarks Green United Methodist Church is in need an organist. The church is offering $8000 as a starting salary. A summary of duties is listed below. For more information or to apply, please contact Julie Nicholas at janicholas13@yahoo.com. 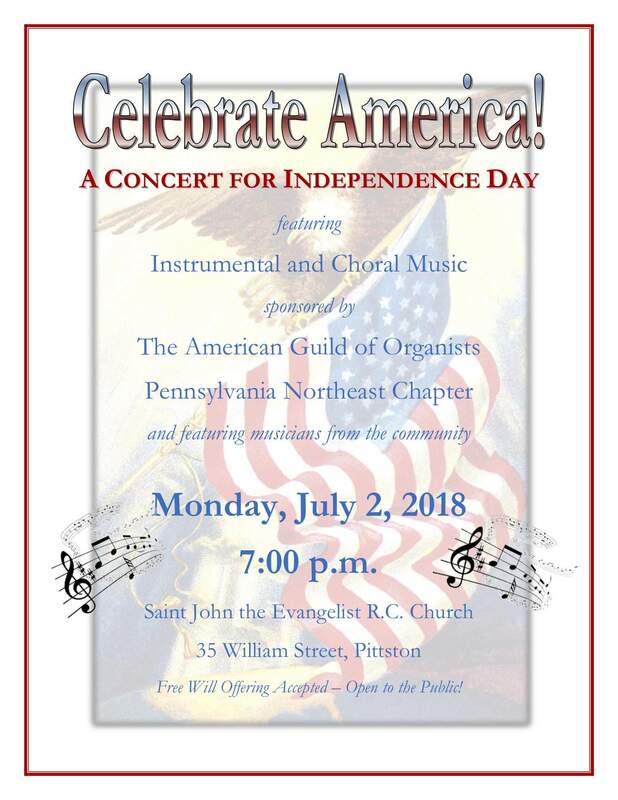 Join us for a concert of American music at St. John’s Church in downtown Pittston on Monday, July 2 at 7:00 p.m.. Members of the Pennsylvania Northeast Chapter of the American Guild of Organists will perform selections on the church’s pipe organ accompanied by a brass quartet and a community choir. Admission is free and the event is open to the public. Members of the Pennsylvania Northeast Chapter of the American Guild of Organists are planning a concert of patriotic music entitled “Celebrate America!” on Monday, July 2 at 7:00 p.m. at St. John the Evangelist Church in Pittston. Chapter members are hoping to form a combined choir which will sing the National Anthem and patriotic hymns during the concert. The choir will be under the direction of Raphael Micca, Dean, and accompanied by organist Michael Sowa, music director at Our Lady of the Eucharist Parish. Anyone who loves to sing is invited to take part in this concert! Rehearsals will be held at Saint John’s on Monday, June 18 and Monday, June 25 at 7:00 p.m. If you are interested in singing, please e-mail Mike Sowa at msowa126@gmail.com, or call him at 570-881-2301 by Monday, June 4.